Fitzrovia was once an overlooked part of the capital, but is now firmly back on the map. It is a buzzy backwater between Oxford Street and Euston Road, as well as Tottenham Court Road and Great Portland Street. 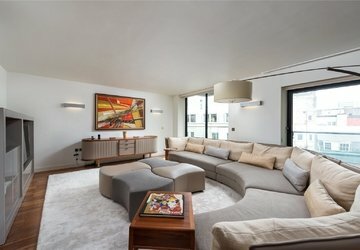 Here you will find a combination of converted Georgian town houses, Victorian purpose-built blocks and modern developments. Some of Fitzrovia’s best streets, include Great Titchfield Street, Foley Street and Charlotte Street. But the jewel in the crown is surely Fitzroy Square with its handsome white stucco buildings, dating back to the 18th and 19th century. Look out for flats above shops and more modern developments, including West One House (the former Channel 4 building) or more recently Pearson Square, which is on the site of the old Middlesex Hospital, too. Head to Fitzrovia for some of London’s leading restaurants, properties and hotels. You will find The Sanderson, The London Edition (Burner’s Tavern with its grand dining room) and The Charlotte Street Hotel. This is an area on the up with properties to inspire. To find out more about properties for sale in Fitzrovia, please see below or contact the local Kay & Co office based in Marylebone on 020 3813 5354. Learn more about Fitzrovia in our Fitzrovia area guide. Unsure about something? Speak to our Sales expert Louisa.